If this is the first time you’ve heard of feijoada, you’re in for a treat. Many foods have something of an infamous history, and this traditional Brazilian dish is no different. Feijoada is, essentially, a stew of black beans and many different cuts of pork and beef. Each region of Brazil has its variations, but it is still very heavy and rich, and therefore only cooked and eaten once or twice a week, chiefly during lunch. The legend surrounding feijoada is that it originated with the slaves, who mostly ate just beans and rice, and were only given the offal, or undesirable cuts of meat by the plantation owners when times were good, or during holiday times. 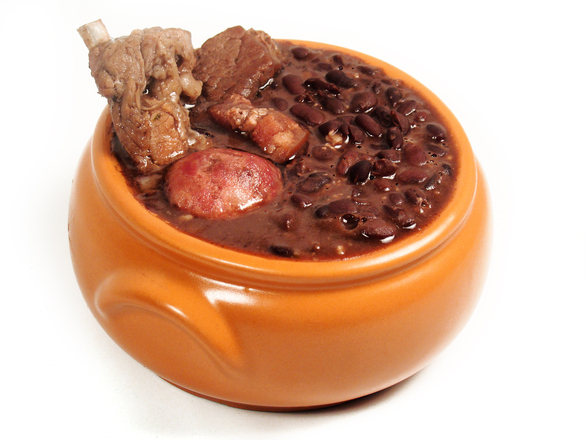 The offal added to the beans gave the mixture a different, delicious flavour, and subsequently, the dish was served back at the plantation houses in a more elegant fashion with more ‘desirable’ cuts of meat, and then, in the 19th century, feijoada was served in haute cuisine restaurants in Rio de Janeiro’s high society areas. At that point, it was adopted nationwide as the official dish. Recently, however, there have been questions as to the veracity of the legend, and these inquiries have been making considerable inroads to breaking down belief in the long-told story. The results of such academic scepticism are that slaves may not have been the original source of Brazil’s national dish. But if not slaves, then what are the true origins? While Brazil is essentially a melting pot, it was chiefly populated at first by the Portuguese. Portugal, like many other countries of southern and western Europe, was occupied by Rome. Because Italy itself is known for using beans in some of its cuisine, it is therefore very likely that the Roman military stationed in Portugal had a bean-and-meat dish very similar to what we know as feijoada. Additionally, there are other similar European dishes that make up many parts of European cuisine, also likely thanks to the Roman Empire. The French cassoulet is one such dish, though they use different types of meat. But the fact remains that it is a dish with beans and meat. The one item in feijoada, however, that makes this particular dish a Brazilian creation, is the use of black beans, which are not native to the European countries that the Romans occupied. So the Portuguese who came to Brazil bringing their own version of feijoada with them likely had to adapt the recipe according to the available types of beans, and black beans are one of Brazil’s chief crops. Another likelihood is that once the Portuguese arrived in Brazil, the native Brazilians were slowly introduced to putting cuts of meat in their bean and rice mixture, giving rise to the legend about slaves that is still so commonly believed to this day. It is not likely we’ll know the exact truth, since time, and the fallibility of human memory, both tend to blur fact and fiction together. What does remain as the truth is this: feijoada has long been renowned as the traditional Brazilian dish, and no amount of anthropological inquiry as to the stew’s origins will ever change its standing in culinary history. So in celebration of Carnival, another of Brazil’s longtime traditions, come have a bowl of feijoada and taste the flavours that make this dish so famous.